Pullman at Sydney Olympic Park is a unique 5 star hotel in the dynamic sports, entertainment, business and technology hub that is Sydney Olympic Park. The upscale hotel offers business travellers 218 rooms, meeting rooms for up to 220 people and wireless Internet in all areas. Enjoy panoramic views of Sydney, toast your success in the chic wine bar and savour contemporary Australian cuisine in Bacar restaurant. With a superb location within Sydney's Olympic Park, Pullman Hotel at Sydney Olympic Park offers business and leisure guests the ideal base when travelling to Sydney. Home to Qudosbank Arena, ANZ Stadium and the Sydney Showground, Sydney Olympic Park attr cts a huge variety of sports, music, leisure and business events. This impressive Sydney hotel is also within easy reach of Sydney CBD and Parramatta CBD, Rosehill Race Track, and a range of public transport options, including ferries, trains and buses. Pullman Hotel at Sydney Olympic Park offers guests access to the many sporting, music and business events held at Sydney Olympic Park, as well as to a range of nearby attractions. Guest are within easy reach of Parramatta CBD and Sydney city centre. 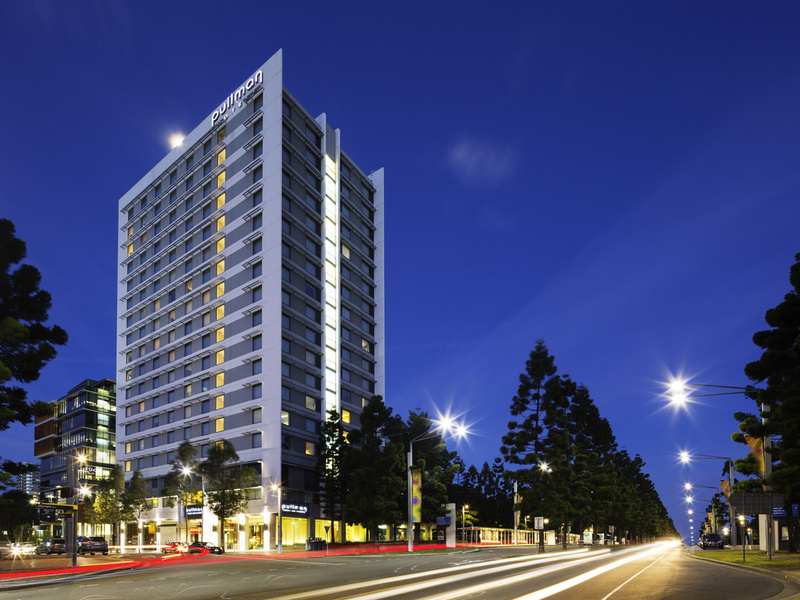 Pullman at Sydney Olympic Park offers Sydney's only 5 star rooms outside the CBD. With modern design, sweeping views, large bathrooms with separate shower and bath and wireless internet. Suites feature spa baths and Executive Lounge access on event days. of accommodation features, including a TV with cable and pay-per-view channels, WIFI access, air conditioning, a minibar, 24 hour room service, sweeping views, and a large modern ensuite with luxury bathroom amenities and a separate shower and bath. Bacar Restaurant is an upscale contemporary restaurant located in the Pullman at Sydney Olympic Park. Indulge in Bacar's unforgettable seasonal menus created by our award-winning Executive Chef Ben Nicholls. The hotel met our expectations in every way except for the lack of a pool. We had chosen the Pullman because the website showed a swimming icon. On arrival we discovered there was no pool but we could have passes to the Aquatic Centre. Overall accommodation was well presented and clean. Breakfast was great, although found Breakfast staff and Bar staff that we interacted with to be less than friendly. Reception staff were extremely friendly and helpful. We had a 2 double bed, room booked for 2 adults and 2 children, these double beds seemed to be basically King Single's rather than a double, extremely uncomfortable sleep for two adults. On arrival found that each bed only had one large Square pillow and one small firm pillow. Room was definately not setup for 2 adults and 2 children. Staff excellent, starting to become expensive . We arrived to very pleasant staff at both the concierge and reception. Nothing was to much bother and the car was parked quickly. The staff at reception were so happy and competent that was taken care of very well. I was lucky enough to be *Guest of the day* and that was a very very nice surprise indeed. 3 out of 4 meals OK. ONE MEAL WAS RAW SALMON! It was not explained. The experience met every criterion I have for efficiency, comfort and convenience in accommodation. Pleasant, comfortable, hospitable and thoroughly pleasant with nothing to criticise and plenty to praise. Staff were friendly and helpful on check in. Early check in was accommodated without a fuss. Was given access to Executive Lounge for business purposes following check-out which I greatly appreciated. Room was lovely - Service was excellent, however I did feel that your food was very overpriced for what was served. Our overall experience, while short was pleasant. The room as usual was clean and comfortable. The only negative was one of your reception staff. I believe her name was Andrea. I found her demeanour to be not so pleasant bordering on rude. I must say that all other staff at reception were delightful as per my normal experience at Accor hotels. A wonderful place to stay. A wonderful experience. Every contact with the Pullman Sydney Olympic Park staff was excellent - helpful, polite and engaging. Despite the very high volume of guests everything we needed was easily accommodated. The staff were amazing. Thank you! The accomodation and all facilities were very clean and presented to a high standard. Our room was well equipped. The centralised AccorHotels booking system was the only aspect that did not provide a high standard of service. I was unable to get my queries addressed through central reservations and I found the staff not genuinely motivated to assit. However when I was able to talk to the reservations manager at the Pullman facility my issue was easily resolved. I find the staff very accommodating. I left my luggage with staff before my room was ready and when I returned later in the evening my luggage was in my room waiting for me. I enjoyed an hot chocolate before retiring to my very comfortable bed. Everyone who we interacted with were welcoming & professional from Joe the valet and Owen at the front desk were lovely.